When I think of game-changing special effects movies, a handful of my favorite titles come to mind; movies such as “2001: A Space Odyssey” (1968) “Star Wars” (1977), and “Close Encounters of the Third Kind” (also 1977). Others include James Cameron’s “The Abyss” (1989), and “Terminator 2: Judgment Day” (1991), as they are landmarks in the advancement of computer-generated imagery (CGI). As a little boy, I was absolutely nuts about dinosaurs. I knew most of their names (triceratops, tyrannosaurus-rex, allosaurus, brachiosaurus, diplodocus, etc.) as well all four major periods in which they existed on earth hundreds of millions of years ago (Mesozoic, Triassic, Jurassic and Cretaceous). One of my favorite toys (pre-Star Wars/Kenner blitzkrieg of 1978) was a battery-operated tyrannosaur toy that I’d received for Christmas when I was about 8 or so. At that age, I found it utterly fascinating that these Godzilla-esque creatures once lived on the very same planet as myself. They seemed so exotic, so beyond the scale of my everyday world. The only reptiles I’d seen at that time of my life were occasional lizards, snakes or turtles (in fact, I once had a couple of pet turtles as a kid). To think of gigantic reptiles being the dominant life forms of Earth in those days was… well, wow. It’s no wonder that one of my favorite movies then was the Ray Harryhausen dinosaur-fest, “One Million Years B.C.” (1966); a remake of a cheesy, 1940 Victor Mature movie (“One Million B.C.”). OMYBC had, at the time, some of the most beautifully-realized (if inaccurate) depictions of dinosaurs I’d ever seen in a movie in those days. Harryhausen’s stop motion dinosaur FX were the stuff of dreams (and a few nightmares). I still remember the sight of the impaled allosaur lying on its side… with a air bladder effect and loud hissing sounds simulating its last gasps of breath. There was also a brontosaur, a ceratosaur, a pterodactyl, a triceratops, and a giant sea turtle (!). OMYBC was a young dinosaur geek’s fondest dream in those days (as an adolescent, I would become even more intrigued by Raquel Welch and her prehistoric bikini… yowza). ^ Raquel Welch in “One Million Years B.C.” (1966) made me feel all kinds of primitive when I was a teenager. As a kid, I didn’t even care that OMYBC had multiple creatures from entirely different eras coexisting (let alone interacting with human beings). What the hell, right? It was as scientifically and historically accurate as your average episode of “The Flintstones”, but the dinosaurs were amazing. Even within the limitations of his meticulous, time-consuming stop-motion animation, Ray Harryhausen did a magnificent job of bringing these creatures to vivid life. ^ Ray Harryhausen (1920-2013) and one of his skeleton soldiers of the ‘Army of the Dragon’s Teeth’ from “Jason and the Argonauts” (1963); one of the greatest fantasy films ever made. Meeting Ray Harryhausen at San Diego Comic Con in 2005 (eight years before he passed away in 2013) was a truly thrilling moment of my life. This was the man who created so many of my childhood memories; the various dinosaurs of OMYBC, and the rogue allosaurus of “Valley of Gwangi” (1969) as well as the enraged statue of Talos and the skeletal ‘Army of the Dragon’s Teeth’ in “Jason and the Argonauts” (1963). He signed my copy of his giant coffee table book, “Ray Harryhausen: An Animated Life” (with his signature “Raaaayyyyy…”). Pretty sure my throat was sandpaper-dry when I croaked out “Thank you, Mr. Harryhausen,” afterward. Despite its wild historical inaccuracies, “One Million Years B.C.” was the gold standard for dinosaur movies… that is, until the summer of 1993. I deliberately did not read the Michael Crichton novel of “Jurassic Park” until after I saw the film, because I wanted to be completely surprised. My sister had read it, but was wisely keeping mum on the details. My friend who came with us that night hadn’t read the book, either. Other than the basic story of an amusement park island filled with genetically-engineered dinosaurs, I knew next-to-nothing about the film. This was one of the rare times of my life where ignorance truly was bliss. The opening of the film saw an employee of the as-yet-unopened Jurassic Park killed during a transfer of a velociraptor into its pen. It was interesting to see Spielberg hiding the appearance of the velociraptors until much later in the film… a lesson no doubt learned from his own “JAWS.” All we see of the velociraptors early on was through inference; shaking bushes, claw marks and cries that sounded like an enraged hybrid of a tiger and a porpoise. Then the movie gets down to the business of establishing its core characters. These characters are gathered up by Jurassic Park’s founder John Hammond (Richard Attenborough) in short order. World-renowned paleontologist Dr. Alan Grant (Sam Neill), paleobotanist Dr. Ellie Sattler (Laura Dern) and pop-mathematician (“chao-tician”) Dr. Ian Malcolm (played as sort of a geek rockstar by Jeff Goldblum) are swept away via helicopter to the fictional Isa Nublar, home of Jurassic Park. They are then met on the island by Hammond’s grandkids Tim and Lex (Joseph Mozello and Ariana Richards, respectively) as well as a lawyer named Genarro (Martin Ferrero), who is representing the park’s unhappy shareholders. Once the introductions are in order, the movie gets underway and it’s a hell of a ride. I remember talking with my friend Jen about the film some 10 years ago, as it was one of her favorites as well. She told me that when she first saw it (at age 13) she literally cried at the sight of the first tree-grazing brachiosaurs in the film. Her reaction spoke so true to me, and I very much understood it. Though I was 26 when I first saw “Jurassic Park”, I’m pretty sure my inner 8-year old (dinosaur-loving) self wept as well. Anyway, I’ll skip a full plot summary of the film, since “Jurassic Park” is so deeply established in pop culture lore that it just seems unnecessary. Instead I’ll just list some of my personal highlights from the film. * The sight of the first brachiosaurs. 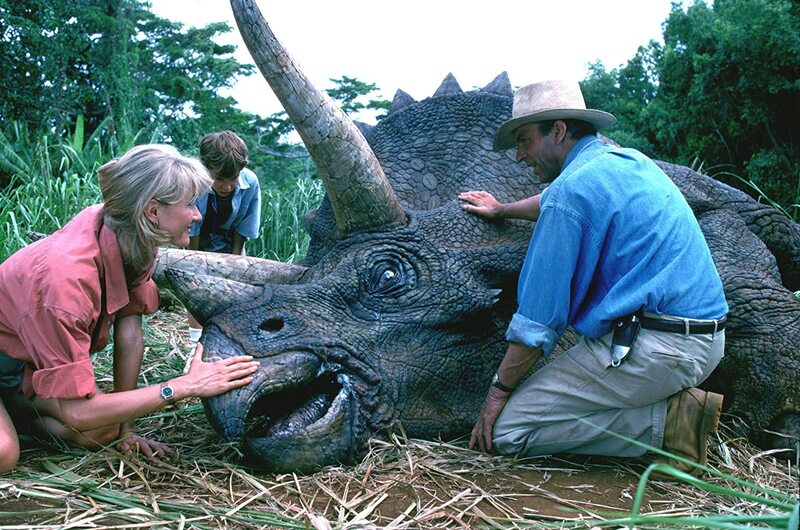 * Dr. Ellie Sattler and Dr. Alan Grant tending a poisoned triceratops. 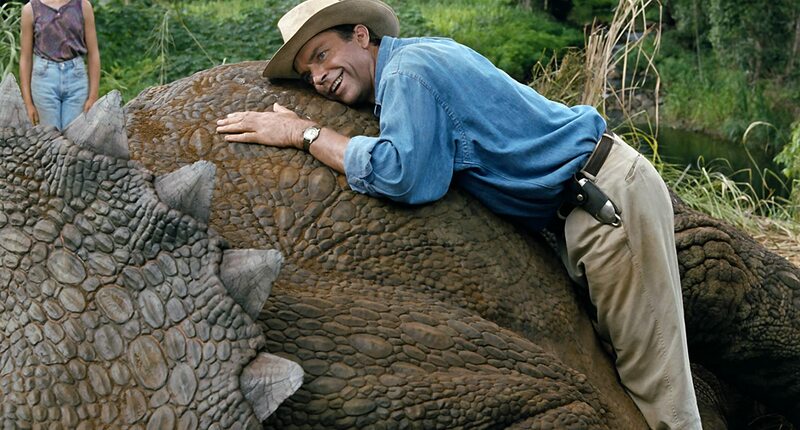 Just the sight of the full-size creature laying on its side as Grant and Sattler lay their hands on its thick, scaly hide adds tactility to these creatures (that quality of the creatures is something curiously missing from most of the “Jurassic” sequels as well). That the creature is ill and unresponsive is also a clever way to avoid the animatronic prop having to walk within the shot. … which might not always be such a terrific thing. … signaling the approach of an escaped tyrannosaur. This was one of the most brilliant and terrifying bits of cinematic foreshadowing since John Williams’ “da-dumm, da-dumm…” shark theme in JAWS. * The T-Rex attack on the two jeeps. This now-famous scene, which takes place nearly an hour after the start of the film, is a showstopper. We see a life-size animatronic tyrannosaur menacing one jeep with Drs. Malcom & Grant aboard, and another carrying a very panicked Lex and Tim. We then see an utterly flawless CGI of that same tyrannosaur running across the screen, chasing after flares. Oh, and did I mention that the lawyer Genarro is snatched right off of an outhouse toilet and eaten by the tyrannosaur? Honestly, what’s NOT to love? Some might think that ‘showing the monster’ too clearly and too often ruins the suspense, but the nighttime setting combined with rain diffuses the visuals enough to give it a nightmarish quality. Not to mention that the panicked reactions of Lex and Tim are so uncomfortably real you can’t help but feel that director Spielberg really traumatized these kids to get the shots. 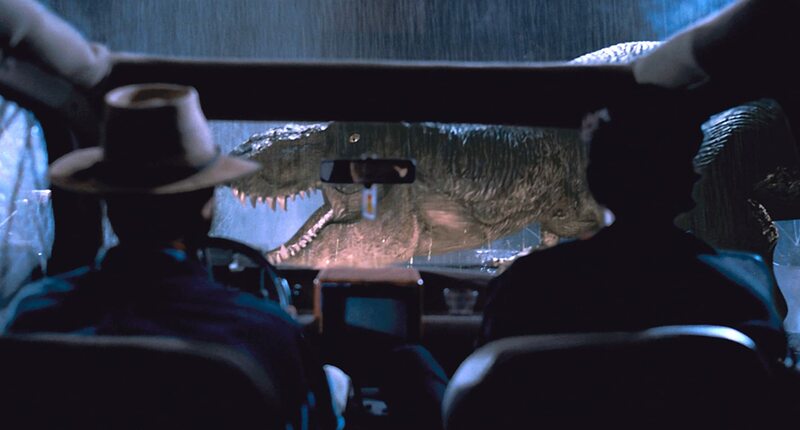 The moment where a thin layer of plexiglass from the upside-down jeep’s rooftop is all that keeps Tim and Lex from the jaws of the attacking tyrannosaur still gets me. Spielberg certainly knows how to get the most out of his monsters as well as his child actors. * The flocking herd of gallimimuses. It’s a scene that arguably could’ve been cut from the movie by a more ruthless editing team, but I’m glad that it wasn’t, because it reinforces the notion that these are animals relatable to animals on our planet today. They’re like a herd of giant geese. It’s also furthers the bond and trust between former child-hater Grant with his two temporary wards, Lex and Tim. The CGI in this scene still holds up very well. The irony of the hunter being hunted, as the park’s resident raptor wrangler, Mr. Muldoon (a relatively minor role, but played to perfection by Bob Peck) finds himself the target of a coordinated raptor attack. His final words, “Clever girl” show his admiration for the creature’s wicked, lethal intelligence. There’s also the nail-biting scenes as the thoroughly and justifiably spent kids, Lex and Tim, are the subjects of a raptor hunt in the park’s kitchen facilities. Serious nightmare fuel there. I’ll be honest; velociraptors were never one of my favorite dinosaurs as a kid, mainly because they were kinda small. Certainly they were nowhere near the sizes they appear in the film. Velociraptors were more the size of a miniature pony, or an adolescent shark. Nevertheless, these animals were pretty vicious, and “Jurassic Park” gave me a whole new appreciation for this species that I tended to overlook in favor of the more ‘glamorous’ bigger dinosaurs, such as brontosaurs, brachiosaurs, tyrannosaurs (my favorites), allosaurs, ceratosaurs and triceratops. Post-“Jurassic Park,” I’d even come to love those clever beasts. The raptors bring the terror of “Jurassic Park” down from Godzilla-levels to a more human-scaled terror… and that’s the kind of terror that gets to you in your sleep. * John Williams’ magnificent score. As with “JAWS,” “Star Wars,” “Superman,” “Raiders of the Lost Ark” and about a million others, John Williams score for the film is simply perfection. Lots of brass add to the majesty and spectacle, while his quieter moments (with appropriate piano and strings) shine as well. It’s no coincidence that “Star Wars” was the very first soundtrack album (hell, probably my very first album period) I’d ever purchased (at the tender age of 10), followed by “Close Encounters of the Third Kind” shortly afterward. John Williams is a national and cultural treasure. This cannot be overstated. * The visual effects of Industrial Light and Magic. 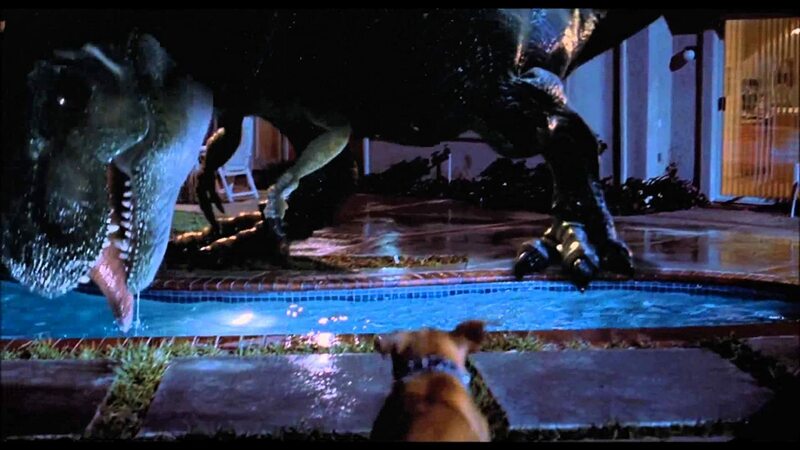 There are only a total of 6 minutes of CGI dinosaur shots in “Jurassic Park” but they are so seamlessly integrated with the live-action footage and animatronic creature work that audiences tend to think of the movie as teeming with CGI work. 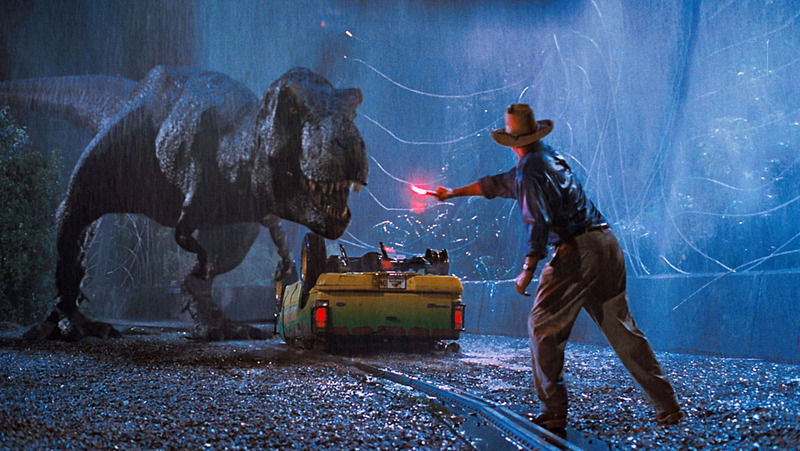 I saw “Jurassic Park” in-cinema again during a rerelease a few years ago, and I was amazed at how well it still held up on a big screen. That said, I thoroughly hated the 3D up-conversion that was added to the film. It made the film look like I was watching it through a Viewmaster while wearing sunglasses. See it in 2D. Always. Trust me. It’s just better that way. * Though the humans in the film take a backseat to the dinosaurs, the actors very much deserve a bow. 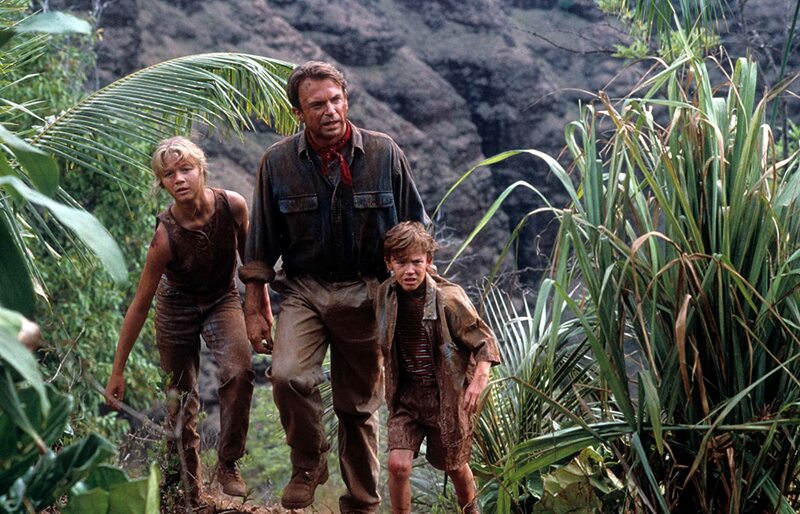 A powerhouse cast of Sam Neill, Laura Dern, Jeff Goldblum, Richard Attenborough, underrated (though very effective) child actors Joseph Mozello and Ariana Richards all deserve a well-earned bow. Without compelling characters to invest emotions in, the movie would be… well, another “One Million Years B.C.”; a fun little dinosaur romp for the kids. As it is? 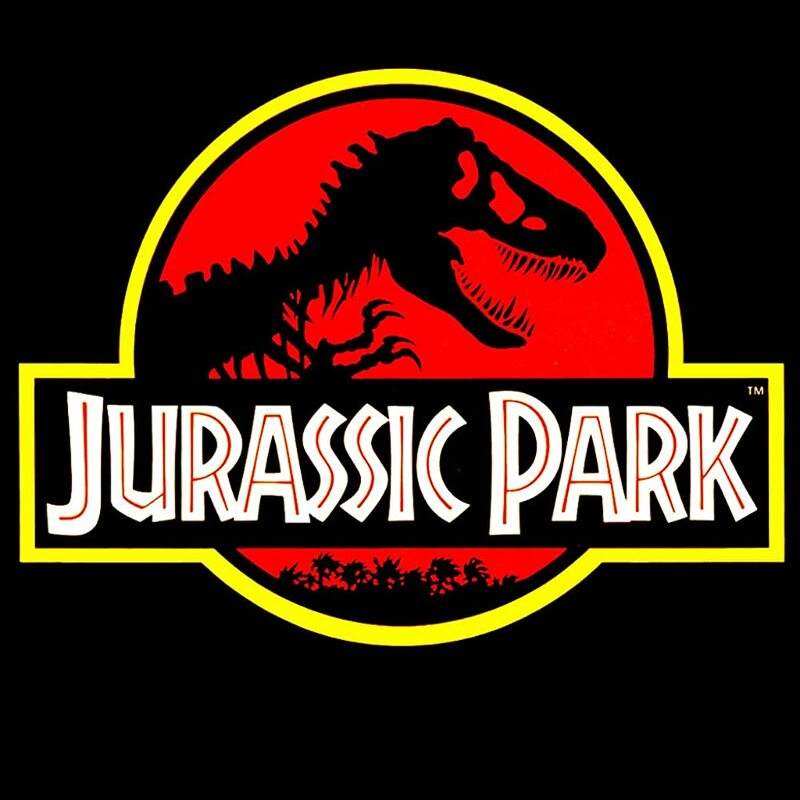 The A-level cast, John Williams’ magnificent music, game-changer FX, and Steven Spielberg’s unique skill with eliciting amazing performances from child actors propels “Jurassic Park” into classic territory. This next section might almost feel a bit sacrilegious, but in the interest of an honest personal account, I’d like to list a few little gripes I have with this inarguable modern classic. * Dennis Nedry (Wayne Knight). Nothing against “Seinfeld”’s resident evil postman ‘Newman’ (“Hello, Newman…”) but Wayne Knight’s performance in “Jurassic Park” is just so over-the-top obnoxious that his villainy is at 1960s-“Batman” levels. In his introductory scene, Nedry is meeting with a rep from a rival genetics company to arrange a theft of embryos from Jurassic Park’s stock. When we first meet Nedry, he is wearing a loud-as-hell Hawaiian shirt, sweating profusely and overeating. I realize this movie was made 26 years ago, but I do remember subtlety existing in those days. When Nedry is given his equipment to smuggle the embryos through customs, he chortles like a drunken possum. During the blackout at the park (for which he’s responsible), Knight affects a nervous stammer that is right out of “Villains R Us.” It’s an egregiously hammy performance that is best served with a side of bacon and eggs (but not dinosaur embryos). I appreciate that is villain is supposed to be hated, but I’ve always preferred my villainy with some relatable or even sympathetic qualities. The best villains don’t believe that they’re villains, that’s the point. Wayne Knight’s Dennis Nedry is so one-dimensional and even ridiculous that his death scene, at the hands of a venom-spouting dilophosaur, simply doesn’t come quickly enough. * Samuel L. Jackson, one of the greatest actors of this generation, is largely wasted. While his chain-smoking, angry Mr. Arnold is a vivid character (“Hold onto your butts!” “Damn, I hate this hacker crap!”), but Jackson is just too great an actor to be given such a thankless role (though his severed arm in the power shed is a memorable jump-out moment; similar to Ben Gardner’s severed head in “JAWS”). Granted, this role came prior to Jackson’s explosion onto pop culture with “Pulp Fiction” (1994) but knowing what he’s capable of? It’s a bit of a shame to see him essentially play a chain-smoking redshirt. 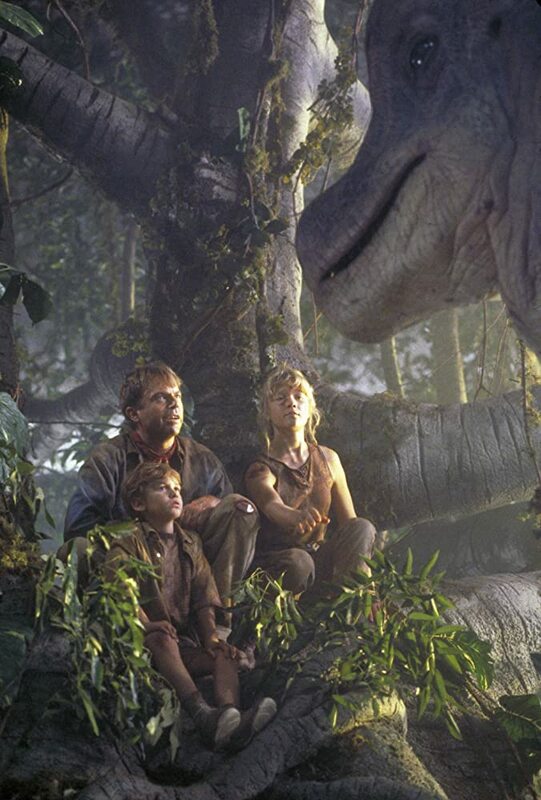 * The sequence with Alan, Lex and Tim in the treetops with the brachiosaur. This isn’t a problem with the writing, performances or most other elements in the scene; in fact, it’s a delightful moment. I really enjoyed Alan Grant simulating the brachiosaur’s whale-song like call. My only nit (and it’s really nit-picky) is with the full-sized head/neck of the brachiosaur. It’s the one full-sized animatronic dinosaur prop that doesn’t quite match the realism of the others. In any other film of this era, this creature would’ve been the best of the best. In “Jurassic Park,” it is conspicuously lesser. As I’ve said, this is a very minor nit. So ends my nits of the movie. “The Lost World: Jurassic Park” (1997). Something of a disappointment. Jeff Goldblum returns as Ian Malcolm, Richard Attenborough returns as Hammond, and even Ariana Richardson (Lex) and Joseph Mozello (Tim) return in brief cameos. New characters don’t fare as well. Julianne Moore (“Boogie Nights”) is Sarah, a former flame of Malcolm’s. Young Vanessa Chester is Kelly, Malcolm’s largely neglected daughter. 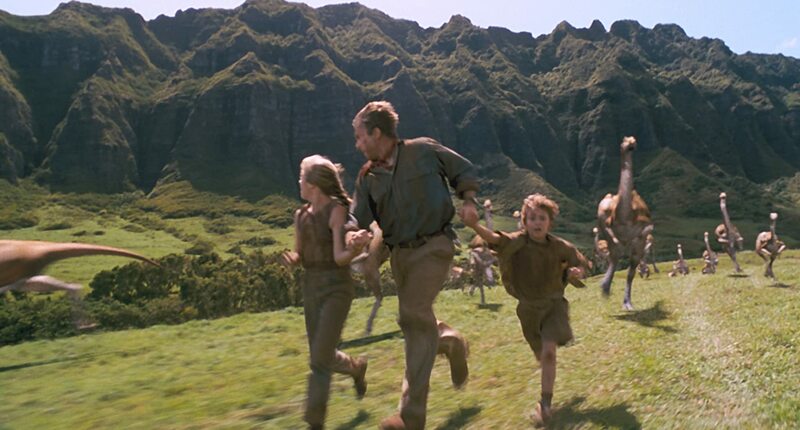 The first three-quarters of the film are essentially a rehash of the first film, as Malcolm and a gaggle of largely forgettable characters return to the island to snag a tyrannosaur to take back to the States. 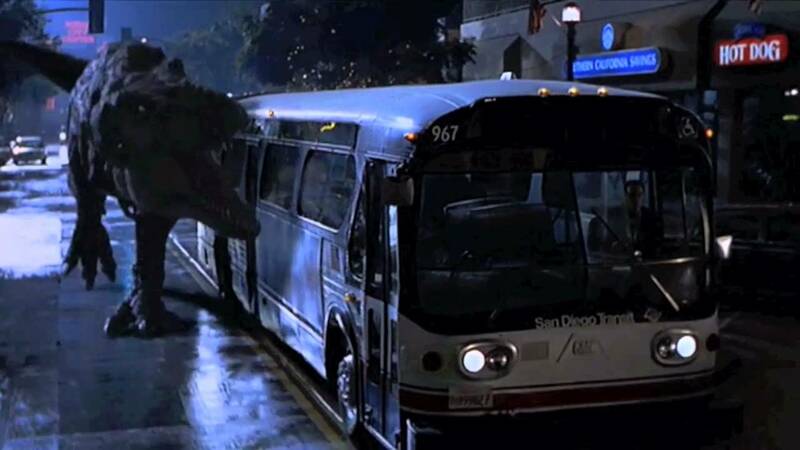 The last quarter of the film is just about worth the price of admission as the tyrannosaur escapes from the ship’s cargo hold and wreaks havoc on downtown San Diego. The rest of the film is somewhat protracted, and frankly, a little boring. Spielberg doesn’t quite bring his A-game to this one. It’s my least favorite of the “Jurassic” movies. “Rocketeer” “Captain America” director (and “Star Wars” storyboard/production artist) Joe Johnston takes the reigns on this leaner, more entertaining sequel which keeps its ambitions more at the popcorn movie-level, and succeeds quite well. This time, it’s Alan Grant (returning Sam Neill) who’s tapped to return when squabbling parents (Tea Leoni, William H. Macy) hire Grant under false pretenses to help find their missing son, who was lost near the island during a parasailing mishap. 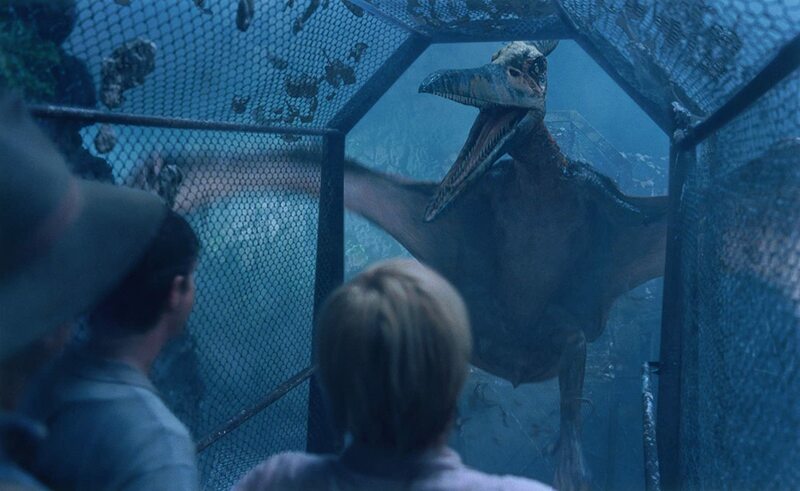 The film has some great moments, including pterodactyls in a fog-shrouded aviary as well as a ‘Tyrannosaurus vs. Spinosaurus’ dinosaur smackdown. The film’s lesser ambitions work in its favor, and it clocks in at a surprisingly slim and efficient 92 minutes. 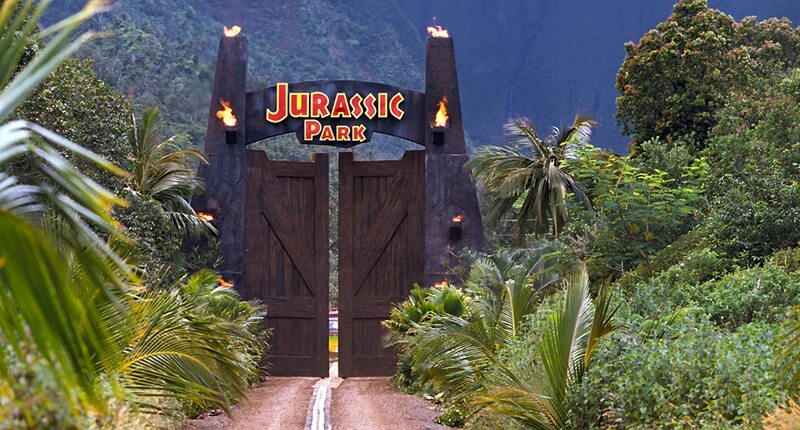 Going back to the crowdpleaser roots of the first movie, this entry is something of a reboot in the guise of a sequel, as we see the park under new management reopening for business 20 years after the events of the first film (a metaphor for the Jurassic franchise itself, which hadn’t produced a sequel in 14 years at this point). “Guardians of the Galaxy” star Chris Pratt (“Owen”) brings a bit of young Harrison Ford-style mojo to the film, and Bryce Dallas Howard (“Claire”) is the new corporate suit in charge of the park’s PR. Claire’s nephews are visiting, and of course, where there are kids and dinosaurs… well, you get the rest. My biggest nit of the film is Claire outrunning a tyrannosaur in heels (!). Other than that, the film works far better than it should. The most surprising thing about “Jurassic World” is that it manages to bring back some of the awe and wonder of the first, even with the novelty long gone (no easy trick). The two new lead actors work very well together, and the dinosaur action is some of the best since the first movie. “Jurassic World: Fallen Kingdom” (2018). 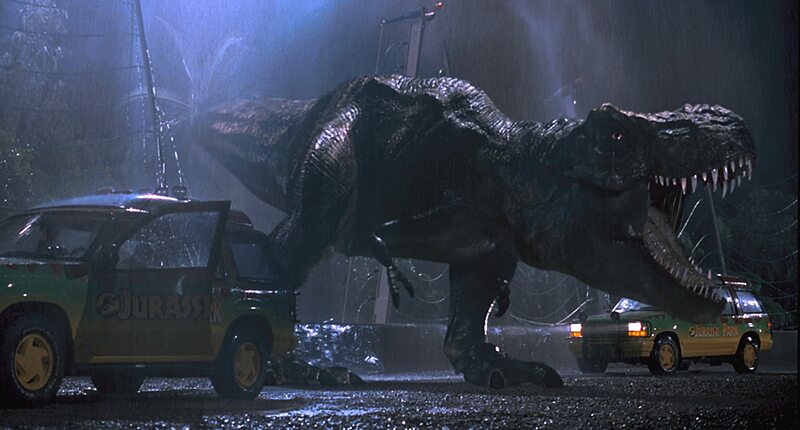 25 years later, “Jurassic Park” is still the gold standard of dinosaur cinema, displacing previous title holder “One Million Years B.C.” It loses very-little-to-none of its luster today, and retains a majestic sense of awe and power. Cinefantastique once called it the ‘“2001: A Space Odyssey” of dinosaur movies’ and that assessment is still accurate today. Various sequels have come and gone, with another coming this summer. Each have enjoyed varying degrees of commercial and artistic success, but none have yet fully captured the novelty and power of the original. 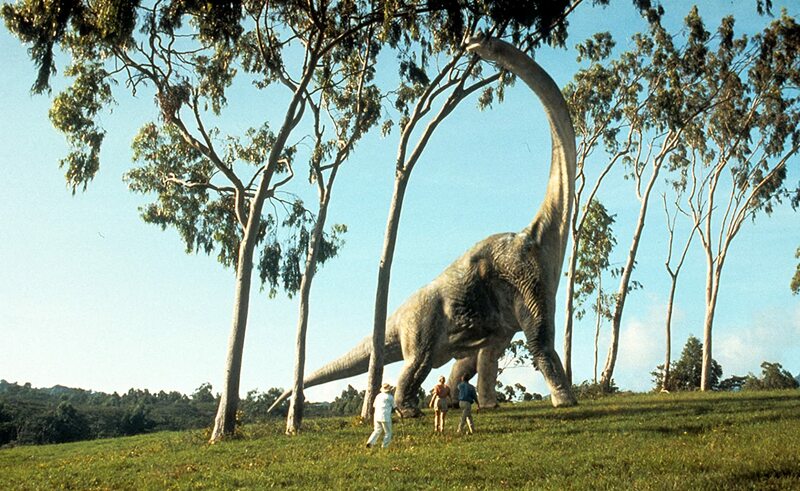 The original “Jurassic Park” is in no danger of going extinct. I saw Jurassic Park around a year ago (I know, my bad) and I totally loved it ! It’s one of my favorite movies of all time now. 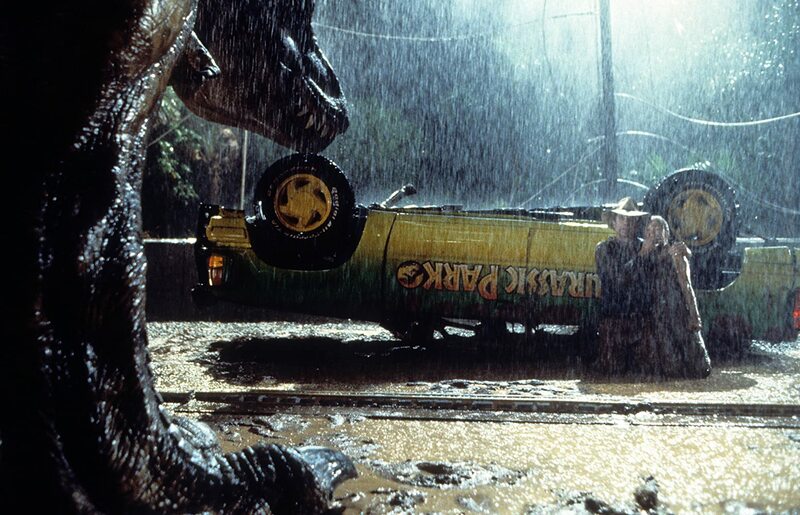 That scene with Rexy attacking the cars during the rain had me so shook with suspense and it made me fall in love with the film. It holds up really, really well. I didn’t like JP2, especially the third act since it had turned into a typical monster movie type of thing. 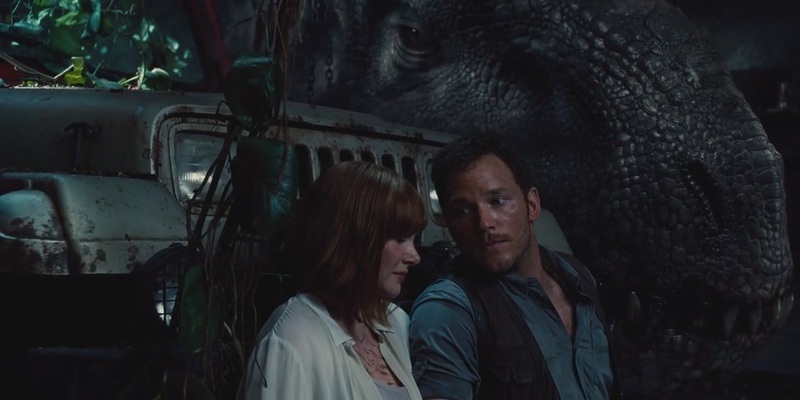 Despite people hating the film, I found JP3 quite good because of the protagonist returning. Some moments had me in suspense like the first film. I didn’t quite like Jurassic World, it’s my least favorite of the bunch. Fallen Kingdom seems like a typical Hollywood monster film which is why I’m not too excited for it. I feel like they deviated too much from the original’s themes. I doubt if they’ll ever make something even remotely good to the first one.